It is estimated that 15-25% of patients with chronic HBV infection will develop chronic liver diseases including cirrhosis, HCC, or liver decompensation. Though some estimates are higher, WHO and CDC currently state worldwide prevalence at 250 million people for people living with chronic HBV. More than 780,000 people die every year due to complications of hepatitis B, including cirrhosis and liver cancer. Hepatitis B is a potentially life-threatening liver infection caused by the hepatitis B virus. The virus is transmitted through contact with the blood or other bodily fluids of an infected person. 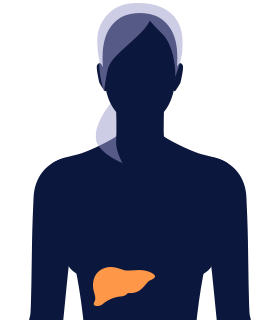 It is estimated that 250 million people worldwide are chronically infected with HBV, and 15-25% of these patients develop chronic liver disease, including cirrhosis, liver cancer, or liver decompensation. It is also estimated that more than 780,000 people die every year due to complications of hepatitis B. The U.S. Center for Disease Control (CDC) estimates the total number of people chronically infected with HBV in the U.S. is between 850,000 and 2,200,000. Combining U.S., Japan, and major EU populations, estimates of prevalence have been as high as 4.9 million. Current approaches to HBV treatment include interferon therapy and/or inhibitors of HBV reverse transcriptase. Treatment with interferon offers modest cure rates, and is accompanied by serious side effects. Reverse transcriptase inhibitors can be very effective at suppressing the virus but rarely result in full eradication of the virus from the liver. New treatments that can provide functional cures to chronically-infected patients are urgently needed. In our HBV research, our initial focus is on on core inhibitors. Core inhibitors, sometimes referred to as capsid assembly modulators, are a new class of HBV inhibitors that can disrupt the assembly and replication of the virus at multiple steps in the virus life-cycle. Enanta has selected EDP-514, an inhibitor of the HBV core protein as its first clinical candidate.